Use it as a shelf lamp, wall lamp or hanging lamp (fits in most Aladdin wall brackets and hangers). Add any Aladdin shade at any time (use proper shade ring). Note: Can use with Aladdin's parchment shades (glass shades are not recommended because of the design of the lamp). IMPORTANT: We recommend using only Aladdin lamp shades with your Aladdin lamp. Generally, Aladdin lamps produce more heat, which other shades may not be able to withstand and, as a result, break. 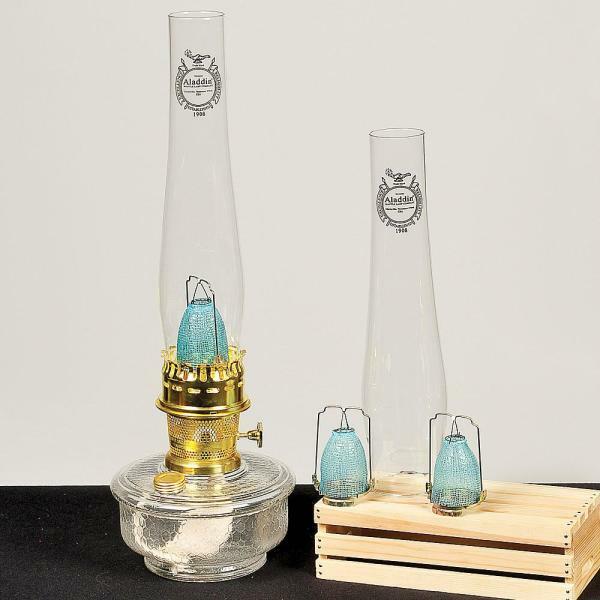 Our Aladdin Genie III Oil Lamp with 3 year parts kit is OUT OF STOCK, but we have ordered more! You are still able to purchase it now and we will ship it to you as soon as it arrives. Questions? Please call 1-800-438-5346 or email us at info@Lehmans.com. Galen Lehman, Proprietor, says, "An Aladdin lamp is the one lamp to have in a disaster. It's the only kerosene wick lamp that burns with a bright white light that's safe to read by. It uses less fuel than any other kerosene wick lamp. It's totally silent, and requires no complicated pumping. And, when you couple it with our exclusive three year parts kit, it means you have a lamp that will be ready for an extended disaster. I have three Aladdin Lamps in my home, including a Genie (which is the best value of any Aladdin lamp)."